EDINBURG — When Paul Garcia accepted Monica Melissa Patterson’s invitation to join the Comfort House Board of Directors in spring 2015, it’s likely he never imagined one day facing her in a courtroom. Garcia, an IT operations manager at a local bank, was the last witness to take the stand Monday as Patterson’s capital murder trial entered its second week. Much of Monday’s testimony focused on the charges of theft and misapplication of a fiduciary, which stem from allegations of financial mismanagement during her tenure as Comfort House administrator. This was prior to Patterson’s August 2015 arrest for her alleged role in the January 2015 death of Martin Knell Sr., 96. Patterson first met Knell in fall 2014 when his wife was admitted as a patient to Comfort House, a nonprofit McAllen hospice facility. She’s alleged to have killed him in order to take control of his large estate. Monica Melissa Patterson looks out at the courtroom gallery during a break in testimony during her capital murder trial in the 370th State District Court on Oct. 2, 2017 in Edinburg. Defense attorney Ricardo “Rick” Salinas questions a witness during the Monica Melissa Patterson capital murder trial in the 370th State District Court at the Hidalgo County Courthouse on Oct. 2, 2017 in Edinburg. 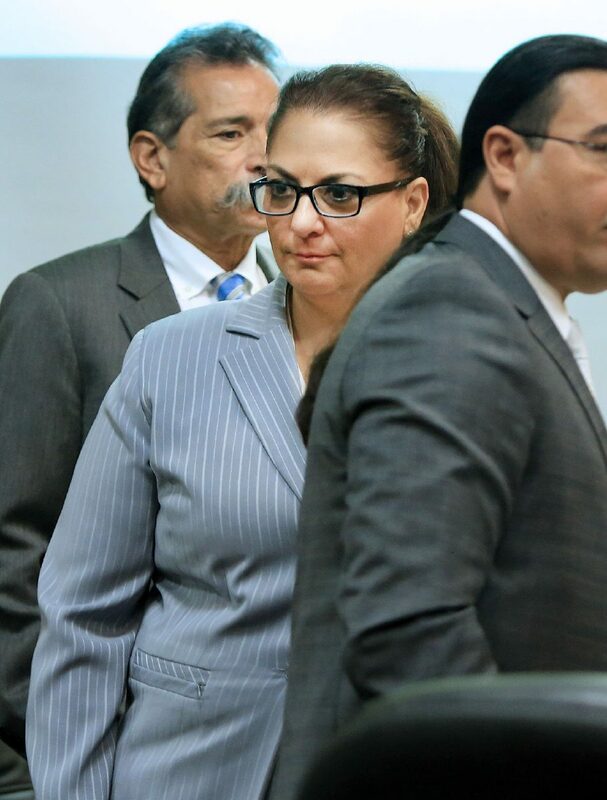 Garcia, who served as treasurer on the board, told the jurors he had never seen the civil non-disclosure agreement Patterson, 50, signed with the board following her arrest, which the state entered into evidence on Monday. The agreement shows that Patterson agreed to pay back Comfort House $70,000 to cover disputed expenses. He said Justice Dori Contreras of the 13th Court of Appeals, who previously served on the Comfort House board, and board president Omar Guevara approached the Palacios family following Patterson’s arrest. They were subsequently involved with the agreement with Patterson without consulting all of the board members, because according to Garcia only approval from half of the 10 members was needed. This marked the first time the Palacios family has been mentioned since jury selection last month. Patterson is the daughter of Hector “Tito” Palacios, a former Hidalgo County Precinct 2 commissioner and former San Juan mayor, and Berta Palacios, a PSJA school district administrator, and sister to County Court-at-Law Judge Jaime “Jay” Palacios. As per the agreement, Patterson and Comfort House waived their right to sue one another. Garcia did not specify who in the family, who wields considerable political influence in Hidalgo County, was contacted. “Was the reason the board decided to accept that money was because they needed to make payroll?” asked Joseph Orendain, assistant criminal district attorney. 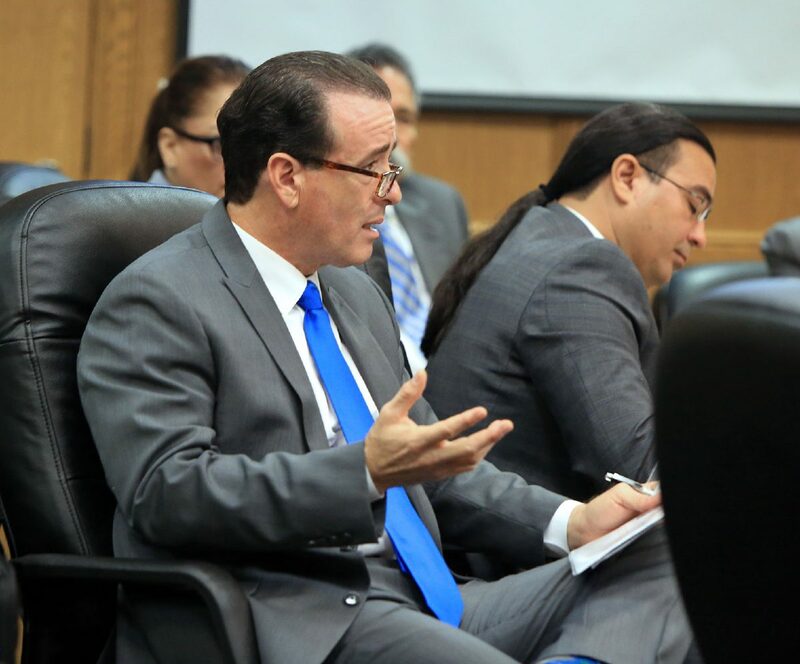 Orendain rephrased the question after defense attorney Ricardo “Rick” Salinas objected due to speculation, simply asking Garcia if there was a reason the board decided to accept the $70,000. “I understood the purpose was to provide funding so we could continue moving forward,” Garcia replied. Last week, Guevara testified that had the board not reached the agreement, Comfort House would not have had the funds to stay open. Garcia told jurors that it costs approximately $30,000 per month to run the hospice center. Guevara said an internal audit he conducted revealed that Patterson had accrued approximately $86,000 in debit card charges and checks for unauthorized expenses unrelated to Comfort House from 2014 to 2015. The defense disputes this amount. Also in question was the Falcon International Bank account Patterson opened and from which she billed personal expenses. Garcia testified that he had no knowledge of this account. On Friday, Melissa Chavez, a former Comfort House caregiver who later served as administrative liaison/finance during Patterson’s tenure, said she couldn’t remember preparing the board minutes authorizing Patterson to open the account in early 2014. A copy of the minutes included in the Falcon account displayed Chavez’s signature. But Chavez said that if she had typed it, she likely would have included her middle initial, which the submitted minutes did not include. Monday’s testimony also touched on expenses related to “Cody’s party,” which refers to the approximately $20,000 high school graduation party Patterson is alleged to have thrown for her son in 2015. Garcia told jurors Patterson had extended the board a broad invitation to the event, though he emphasized that members had not approved any expenses related to the party. Salinas’ line of questioning seemed to hint that the party could have been thrown as a Comfort House benefit since the invitation was made during the nonprofit’s annual “Style Show” fundraiser. “Did you ever do anything gratuitous for any of these people in response to any of their donations or any of the items that they gave back for auction or for a raffle?” Salinas asked. Garcia replied that he believed “just thank-yous” were sent out and couldn’t remember doing anything special for those that donated to the organization. This story was updated to reflect the correct year that Monica Melissa Patterson first met Martin Knell Sr.